Pleasant Details Moving to West Ashley to Better Serve Charleston. 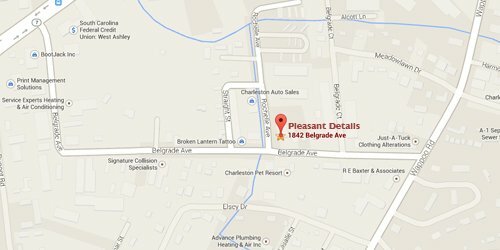 Pleasant Details started as an automotive detail company in 2002 servicing Mt. Pleasant. Over the years we became the best at offering automotive appearance services to clients, auto dealerships, car clubs, auto events, and car collectors throughout South Carolina. We never became complacent and listened to our clients’ suggestions for whatever additional services they wanted us to offer. Over the years our services have included window tinting, hydrographics, shrink wrapping, clear bra paint protection film, vinyl graphics, and mobile detailing. It didn’t take long for us to bust at the seams as we mastered these offerings, providing better quality and prices for our clients. The Daniel Island location gave us a large enough space to accommodate all of these services. Our 12,000 sqft. Marina Dr. location has served us well and we will miss it dearly, but we are happy for the new construction company that has acquired the building. What’s in store for Pleasant Details now that we’re moving to West Ashley you ask? With the new move, we have decided to scale back our offerings and focus on our best services. Our two favorite skill sets, 3M Clear Bra Paint Protection Film installation and Vinyl Vehicle Wraps will be our primary services. Pleasant details is the leader in Vehicle wrap design and fleet wrapping application in Charleston. We work with small and large, local and national companies to design and wrap their vehicles. Budget minded, we will produce a wrap design that will make your company stand out amongst the competition. We have a full staff of award winning designers along with our award winning certified installation team. We design, print and install all in-house with our own staff; which is very rare in our industry. Please feel free to visit our new facility to learn more about why everyone is talking about Pleasant Details! When it comes to Paint Protection Film in Charleston, Pleasant Details has the most experienced and knowledgeable staff in the business. We have been installing film for over 5 years and continue to push the limits of what’s possible. We were the original company to start installing full panel coverage with 60″ film when it was first released. We have trained with the top installers in the industry from the best shops in the country. We have 5 certified installers on staff that service retail and wholesale for auto dealerships all around the low country. We utilize the latest Xpel DAP kit software to cut vehicle kits on our three graphtec plotters that can cut up to 72″ wide before we pull your vehicle on our 4 post lift. We use only the best films on the market and fully understand which ones work best for your specific vehicle. If you’re considering getting a vehicle wrap, our advice is to you is to visit the shop, meet the installer, ask to see their work, ask for film samples, ask to see the vehicle lift, ask to see their certification, ask for a referral, ask for a detailed explanation of the coverage area, and for the warranty, and ask for pricing. We stand behind our work and will guarantee your satisfaction. Trust the professionals and contact us today do see how we can protect your vehicles paint. Our new facilities are located in West Ashley, just off of Wappoo Road, on Belgrade Avenue by Autometrics and located within Bison Branding. We have a full production facility and a dedicated climate controlled install center. Please feel free to contact the owners who take part in every step of the job to ensure quality. John and James are Charleston natives who have established a great business and employ over a dozen highly skilled staff members. We look forward to seeing you soon and are excited to show you the great work we can do for you. Thank you for your continued support in 2014! Visit Pleasant Details online today and see what we have in store for your next visit!! !